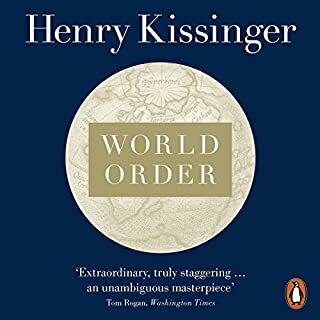 Penguin presents the unabridged, downloadable audiobook edition of World Order by Henry Kissinger, read by Nicholas Hormann. World Order is the summation of Henry Kissinger's thinking about history, strategy and statecraft. As if taking a perspective from far above the globe, it examines the great tectonic plates of history and the motivations of nations, explaining the attitudes that states and empires have taken to the rest of the world from the formation of Europe to our own times. Virtually all human societies were once organized tribally, yet over time most developed new political institutions that included a central state that could keep the peace and uniform laws that applied to all citizens. Some went on to create governments that were accountable to their constituents. We take these institutions for granted, but they are absent or unable to function in many of today’s developing countries—with often disastrous consequences for the rest of the world. Francis Fukuyama, author of the best-selling The End of History and The Last Man, and one of our most important political thinkers, provides a sweeping account of how today’s basic political institutions developed. The first of a major two-volume work, The Origins of Political Order begins with politics among our primate ancestors and follows the story through the emergence of tribal societies, the growth of the first modern state in China, the beginning of the rule of law in India and the Middle East, and the development of political accountability in Europe up until the eve of the French Revolution. 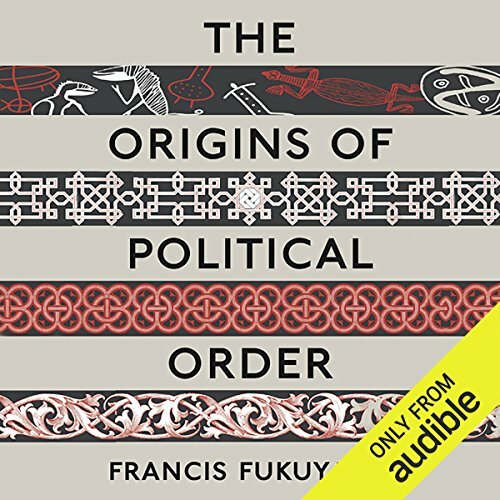 Drawing on a vast body of knowledge—history, evolutionary biology, archaeology, and economics—Fukuyama has produced a brilliant, provocative work that offers fresh insights on the origins of democratic societies and raises essential questions about the nature of politics and its discontents. 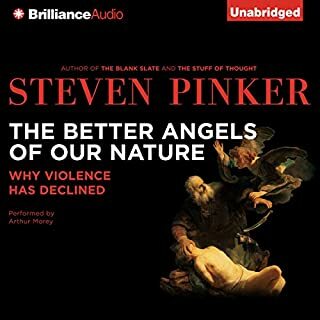 ©2011 Francis Fukuyama (P)2011 Audible, Inc. This book is simply amazing. As a political science major in college and graduate school, I've read a ton of histories and evaluations of politics but nothing comes close to this work. Fukuyama writes a complete and thorough analysis of human politics that is full of in depth case studies and insightful information. I would definitely recomend this book not only to poli sci students but also anyone wishing to know the origins of our political order. 46 sur 47 personne(s) ont trouvé cet avis utile. 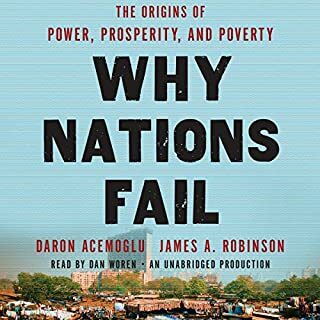 The author does a definitive survey of political development through out the world while avoiding the ODTAA ("one dang thing after another") trap survey books of this kind can often fall into. This kind of information often pops up in many of the books I read, but is never covered as a primary topic nor as definitively as this author covers this topic. Usually, it's hard to get a good description of the political history of Islam, India and China, and most authors force the story into their comic book characterization narrative of those societies so that it will fit into their narrative so that they can show the supposed superiority of the West. This book doesn't do that whatsoever and gives each region it's full due respect. The author not only looks at each major civilization and parts thereof as an end in itself but will contrast it with the familiar when needed. Political systems need three things in order to prosper fully: accountability, transparency, and "rule of law". All three aren't necessary, but each sure do help. The earliest systems start with a "kin and friend" system and develops from there. The author steps the reader through the process and how it differs depending on the civilization. The author shows that Rousseau (man is perfect until government corrupts him) is wrong about everything, Hobbes (government is only to protect against violent acts) only gives a barely adequate government, and Locke (live, liberty and pursuit of property) gives the most responsive government, and the author shows how these stages can develop or never existed in this first place as in the worldview of Rousseau for the different societies studied in this book. The author speaks with authority on the topic and this book filled in a lot of holes on the topic that I got from reading other books which never fully developed the topic. 17 sur 17 personne(s) ont trouvé cet avis utile. What did you love best about The Origins of Political Order: From Prehuman Times to the French Revolution? Fukuyama begins by describing pre-state human social groups--and human biology--to be used as a foundation for the rest of his compelling theory for how states are formed--or rather were formed in history. 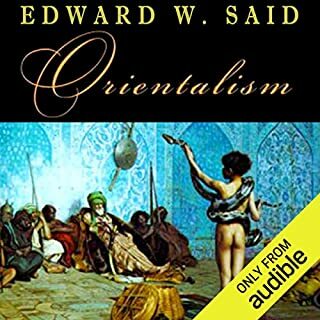 His historical account of the development of states in China, India, the Ottoman empire, and Europe demonstrates that the road of state formation varies greatly, and is not at all purely progressive. The outcome of state formation is also varied (as we can see in the modern world). 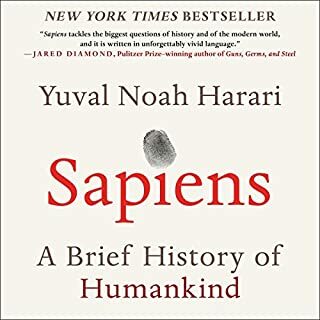 If nothing else, the first half of this book is a great overview of the development of different societies. Fascinating. And really not dry. Fukuyama is just detailed enough to make his theories convincing, one being that central components for a modern political state as we see in Western democracies require: a strong state, the rule of law, and state accountability to all citizens. Many states have one or more of these things, but every modern political order must have them all. 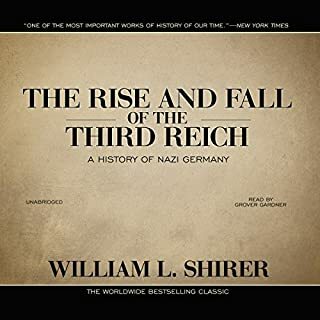 His whole book is a build up to an upcoming second volume which will describe why in modern times state formation can proceed more directly and purposely than it has in history: with so much violence and suffering.This first volume is interesting, but is not directly relevant for understanding the workings of modern states we currently live in. Such insight I believe will come in the next volume. Still, a fascinating read! This is a narrative--the author's narrative--of how states formed in history. And it reads like a narrative. It's not exactly a light read, but the strong narrative aspects make it a very compelling read. Davis narration is very clear with perfect pronunciation of works in other languages (well, as far as I can tell). His pace is great and his emphasis of works in sentences actually helps in understanding what Fukuyama is saying. Fukuyam's insight of the pre-conditions for a modern liberal capitalist state is convincing and based not just on his historical research, but a solid socio-political philosophy as well. When I taught at university level, I quickly discovered how few academics knew how to explain anything concisely. They are asked a question, or the state a goal for their discussion, and proceed to give an answer that may technically be correct, but is not very helpful to the listener. This the exact sort of feel I got from this book. Fukuyama promises a book about the origins of political structures in general, but instead presents us a book loaded with extraneous (albeit probably accurate) details, so much so that any sort of generalization that he wants to draw attention to get lost in the trees. 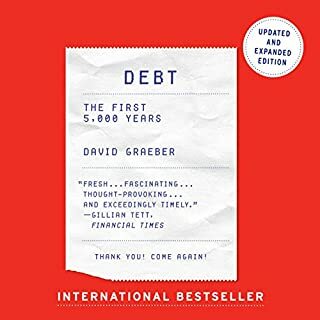 After some preliminary information about biology and prehistory (which is written well), the author launches into an hours-long description of China, including many, *many* details about the country, its people, and its history, and the evolution of its government. Great if I wanted to know all about China and its governmental history, but not so good if I am looking for something more succinct and generalizeable. If Fukuyama tried drawing any sort of general principle out of this whole discussion, I missed it, buried among tons of details. Where's the focus? The author then continues this pattern with India and then the Ottoman Empire, heaping on the detail while obfuscating his main points. I did find some of the detail very interesting, I'll admit, and he does a pretty good job at presenting some of the topics. For example, his discussion of slave armies is very good indeed, as is his discussion of religion on the Indian subcontinent and how it affected the formation of some parts of government. But in the end, I got tired of slogging through all the unfocused detail, which in the end led me to stop listening about 75% of the way through. 70 sur 74 personne(s) ont trouvé cet avis utile. NOTE that this is largely the same as my review for the other book - Political Order and Political Decay. I came at this book hoping for a argument supporting a general theory of political development. I did not get that. Instead, this book asserts at the start a sort of theory of political development ('three core institutions'), and uses it to tie together and compare a bunch of stories about political development. Fukuyama asserts early in the book three 'core institutions' of political order - a strong state, rule of law, and accountable government. It is hard to actually extract what the precise theory is, aside from "having these institutions is good." The advantage of this approach is that I learned a lot about the various countries used as case studies. These 'basic in China, India, the Egyptian and Ottoman Empires, and European political development. This core institution framework is actually a pretty good model for describing big themes in the history of countries and then comparing them. The disadvantage of this is that I didn't get what I wanted from the book, and was vaguely insulted by how it was presented. I learned facts; I wanted theory. I learned what did happen; I wanted a tool to help me think about what is going to happen. The book is deeply disappointing on this score. - It is one half of a book. It is not complete without the other half, Political Order and Political Decay. Not only that, but much of the argument in this book is presented as a prequel to the big reveal of the theory of political decay in the following volume. Not a big deal, but it does involve a 48 hour plus listening commitment. 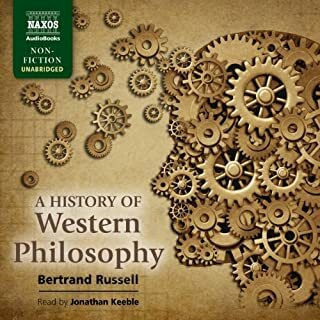 - There are several places, mostly in political philosophy, where I found his descriptions of other authors' theories to be wildly off the mark. His 'state of nature' section misses the intent and purpose of those arguments. He similarly misses the point on Malthus. I, personally, found these infuriating; but I can see passing by them if that's not your particular flame to wonk about. - There are several bad habits of speech, writing, and thought that are consistent throughout the book. They wouldn't be so bad after a seven hour book - after a total of 48 hours they grated heavily. Specifically, Dr. Fukuyama failed to exercise proper discipline on his use of the world fail; his often frequent use of some unneccessary caveats may have contributed to the partial watering-down of his theories, and his used a high level of quantitative descriptions without a corresponding description of what the levels mean. 25 sur 26 personne(s) ont trouvé cet avis utile. If you could sum up The Origins of Political Order: From Prehuman Times to the French Revolution in three words, what would they be? If you’ve listened to books by Francis Fukuyama before, how does this one compare? 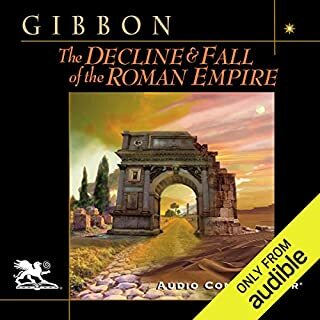 This audiobook is an interesting, educational look at some of the biggest political developments in history. It tries to see things in each era and under each political system in the way that an average person during that era would see it. It provides perspective, but ultimately feels like it compares every system with democracy. Granted, it isn't a big deal, but I enjoy my books to be unbiased, and this one is pretty much unbiased. I have only good things to say about this book and it's narration. Fukuyama sets out to write a history of Political order and the developments of the core parts of the state and achieves this goal definitively. I thought the pace was excellent, as was the narrative progression. It moved freely yet logically between the micro and the macro perspectives. It even manages aptly walk the line between too much and too little background information for the various topics, institutions and regions, which could not have been easy given the subject's breadth. 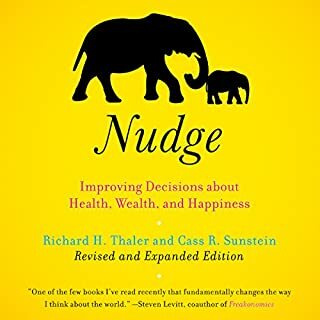 For me, this was one of the books that subtly adjust my understanding of not just the subject matter on the page, but also of a range of other areas and disciplines as well. I HIghly recommend this book to anyone interested in Politics, History, or virtually any other area of Non-Fiction. 42 sur 48 personne(s) ont trouvé cet avis utile. As life unfolds on our planet, I think it's important to remember that the human experience is, and always has been, an experiment in-progress. As with all experiments, there is no guarantee of success. Since 1947, the year I was born, the world has changed nearly beyond comprehension. Lately, I have wondered if things have developed more rapidly than our ability to manage them. If we can no longer effectively manage our ever more complex world, then chaos can't be far behind. And, it appears, that could be in the offing. Human progress over the centuries has been a blood-sport. Social reforms have frequently come as a result of war pushing out the olde to make room for the new. The establishment tends to not let go easily. But this book suggests a new possibility for change, more in keeping with our maturing as a thought-directed species. By comparatively analyzing the dynamics of past and present cultures, recognizing that the actual development, or lack thereof, of governance has been influenced by many extraneous factors, common principles can be gleaned from the data that can help guide us in making pre-emptive changes, hopefully before the current order falls apart. Professor, political scientist, economist and author Francis Fukuyama is an ambitious fellow. 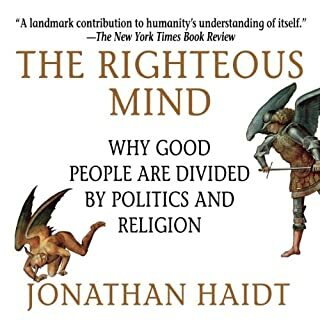 He apparently believes that we've reached a sufficient point in our mental and social development to begin learning from our collective past, and we can now use this comprehensive "enlightenment" to create a better world. What a concept! As we casually ignore nature's championing of survival-of-the-fittest, and the degeneration of our species that naturally results, there needs to be some balancing activity on the other end of the spectrum. Using the kind of information contained in this book to do some 'Steve Jobs'-type engineering, that's right- social engineering (sorry, Newt), we should be able to come up with a system that encourages innovation, rewards free enterprise AND liberates Everyman from the stranglehold of the special interests of the new Global Corporate economy. Wouldn’t that be nice? Mr. Fukuyama is not perfect (It's reported he voted for Obama, at least in part as protest for the devastation caused by 8 years of George "W" – understood), but in my opinion, this is a seminal work. I searched before ordering this book to see if there was anything else like it. If there is, I couldn't find it. He's not, as far as I can determine, pro-left or pro-right. If he's pro anything, he's pro-science. Do the research, ascertain the facts and let the results fall where they may. There is a right way and a wrong way to do things. If we can wrench this subject away from the greedy sort who want to keep everything they have while grabbing for more, I think most of the rest of us will agree on the results. We are, after all, ancestrally connected. The majority of us all want the same things. If we base our method of trying to attain our common objectives on an understanding of the several millenia of history that is available to us, I think we'll have a much better chance of getting what we all want. Or we can just let it collapse, which it appears to be headed for doing. 43 sur 51 personne(s) ont trouvé cet avis utile. An interesting overview of the development of governance in the ancient world and the middle ages. Panoramic view across cultures and the globe which provided some "oh that's how and why that developed here, but not here." Not being a specialist, it helped me understand the differences between tribal kinship systems in China and the feudal systems in Europe. It was interesting to speculate about the role of the Catholic Church in the development of an independent judiciary, the separation of powers, and the rule of law. The importance of religions in setting the groundwork for the development of the rule of law which was a missing ingredient in China which offers an explanation of their continuing struggle in developing rule of law. I would recommend that you download the PDFs because the maps and tables help provide some insight into the different areas in their historical context. Would you listen to The Origins of Political Order: From Prehuman Times to the French Revolution again? Why? YES. I have listened to this once through and been introduced to a large variety of concepts which were fleshed out with many great case studies. 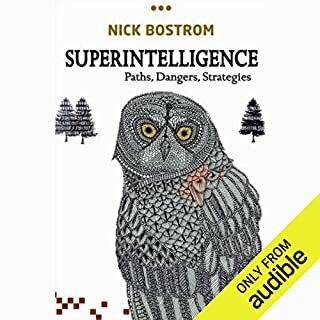 This book contains so much information in a format which is so easy to follow that a second listening would bring so much more of the subtle details to stuff I know rather than just something you heard. The organization of the theories he presents is superb, with case studies to support each claim. There are enough case studies to be convincing and interesting, without going into so much detail that it is impossible to follow. Furthermore, I really appreciate the comparative nature of his methodology, not just beating a case to death but using broader trends throughout different societies to back up each of his points. The performance was great, haven't heard anything else he's narrated. He paces it just right so you can listen. There were a few times when I missed sentences and had to go back because of the intense thought used in processing previous sentences, but this is largely a function of the book being incredibly well written. The narrator paced himself well so that those moments weren't too common despite the density of the neat ideas in this book. There were 2 problems with this book: 1) there are times (few, but noticeable) when the author made lists to prove his point. When this happens, its incredibly hard to follow specifics listening rather than reading which allows to reread the numbers. They were never excessive or damaging, but in a perfect world would not be there. 2) This really is just up to the beginning of the french/american revolution. It is incredibly frustrating that modern day political order he left for a second book which is not out yet, as this one was put together so well I am antsy for the second volume. The book is excellent. I would rank it among the best books of political science and history of politics that I have ever come across. It is also one of the first books in English that I know on the subject that does not dedicate 75% of its content to an analysis of the US or the UK. The parts covering China, India, the Catholic Church and the Islamic world are excellent. I have no complaints about the Audiobook. The reader is good and text is pretty ok to follow, without much complicated jargons or vocabulary.